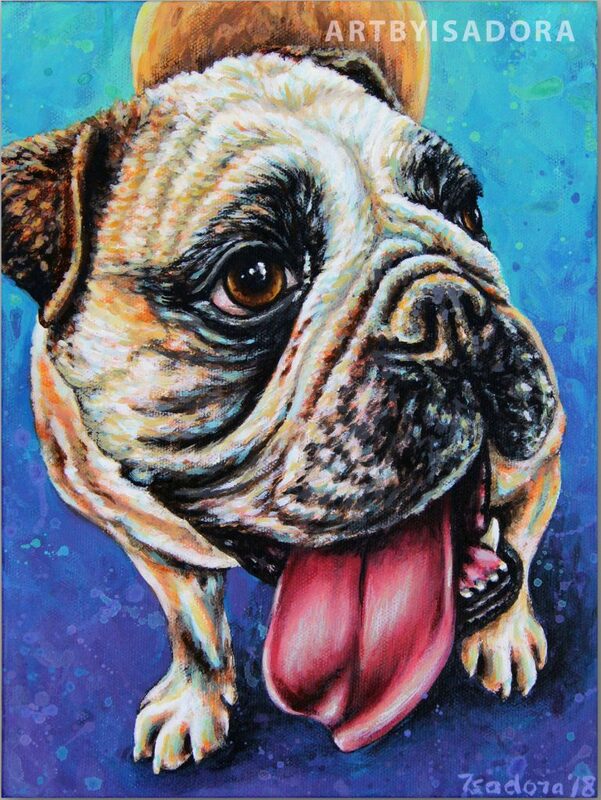 Having your dog or cat hand-painted on canvas is probably less expensive than you think. 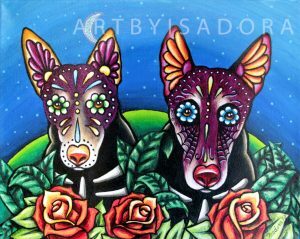 I am a professional artist residing in Phoenix, Arizona who specializes in dog, cat and other pet portraits from photos. 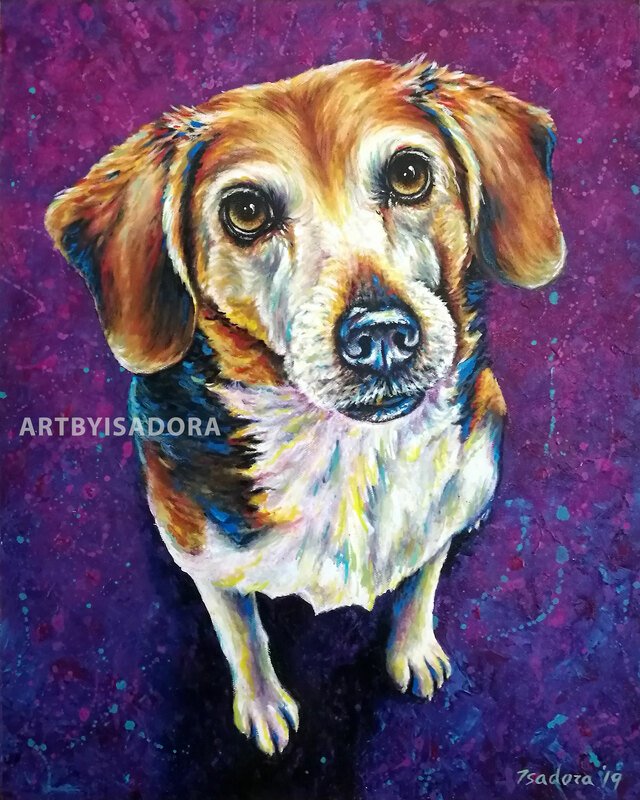 Hand-painted Custom Pet Portraits on gorgeous, professional quality stretched canvas, in a variety of styles to suit your decor and personal aesthetic, ALL start at under $100. In fact, at the time of this post, my least expensive option, simply because it's the smallest, is just $75. Below are the various styles of pet portraits I offer. Click the link below each one to view size and pricing options. Rest assured that each order, no matter how small or large, is treated with the same care and customer service. Click the title below any of the portrait styles above to see pricing and size options for that style, or click here to go to my Etsy shop, which has them all on one page. As always, if you have any questions at all I'd be happy to answer them! Click here to send me a message. Recently I've posted a bit about my colorful pet portraits, but did you know that I also paint realistic dog portraits from photos (or cats, horses, you name it!)? 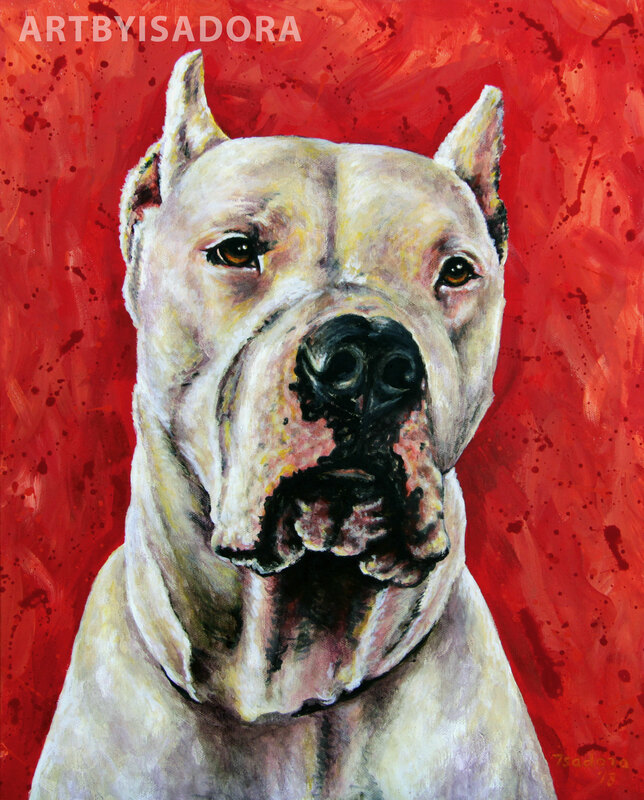 I absolutely love to paint classical, elegant portraits of dogs, cats and other pets. 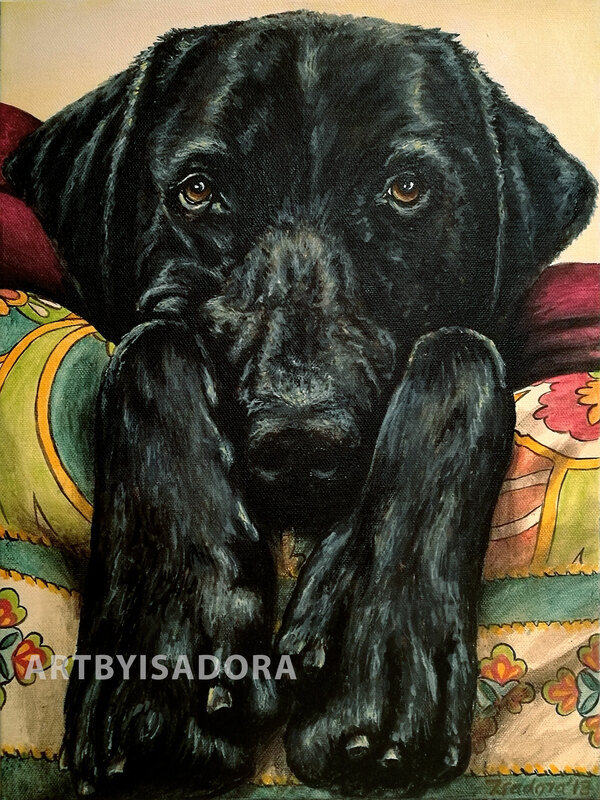 If You are interested in having your pet's portrait painted from your photos in a beautiful, realistic style, please click here to view size and pricing options. Here are a few samples of realistic dog and cat portraits I've completed for customers. 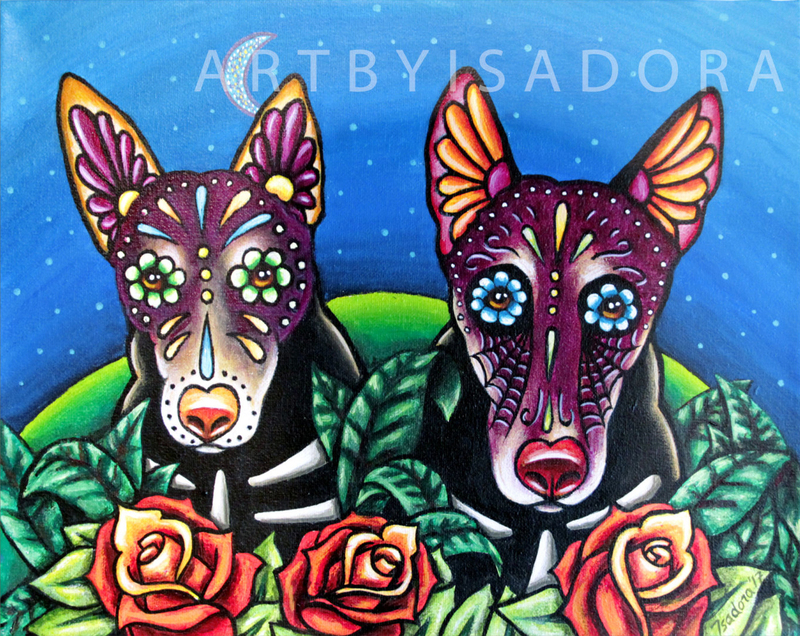 I have just shipped out this new custom colorful dog portrait off to a customer today. Any Beagle lovers out there? This adorable breed really suits a bold portrait style. Lily the beagle was painted from photos her family sent to me, to their color and style specifications. Interested in having your dog painted from your photos? 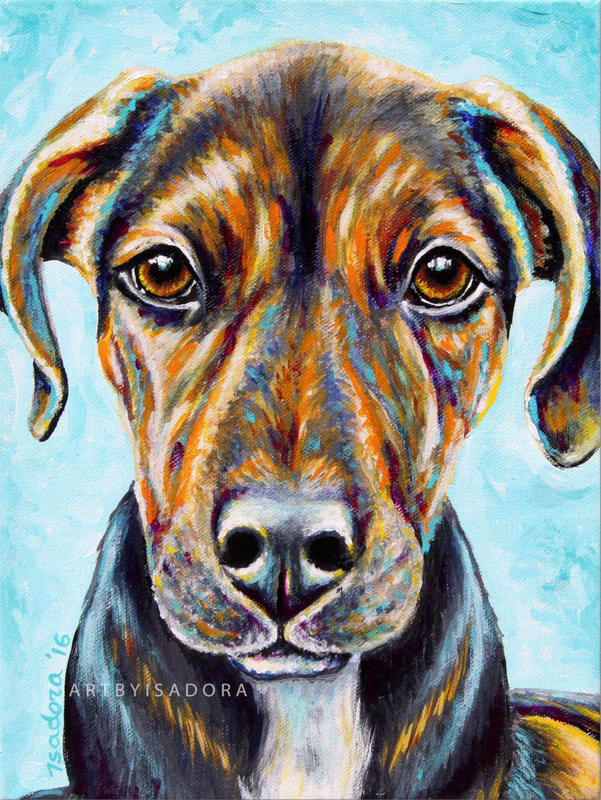 Click here to order your own custom colorful dog portrait on canvas! Now, without further ado, here’s the portrait of sweet Lily. I hope you love it as much as I loved painting it! 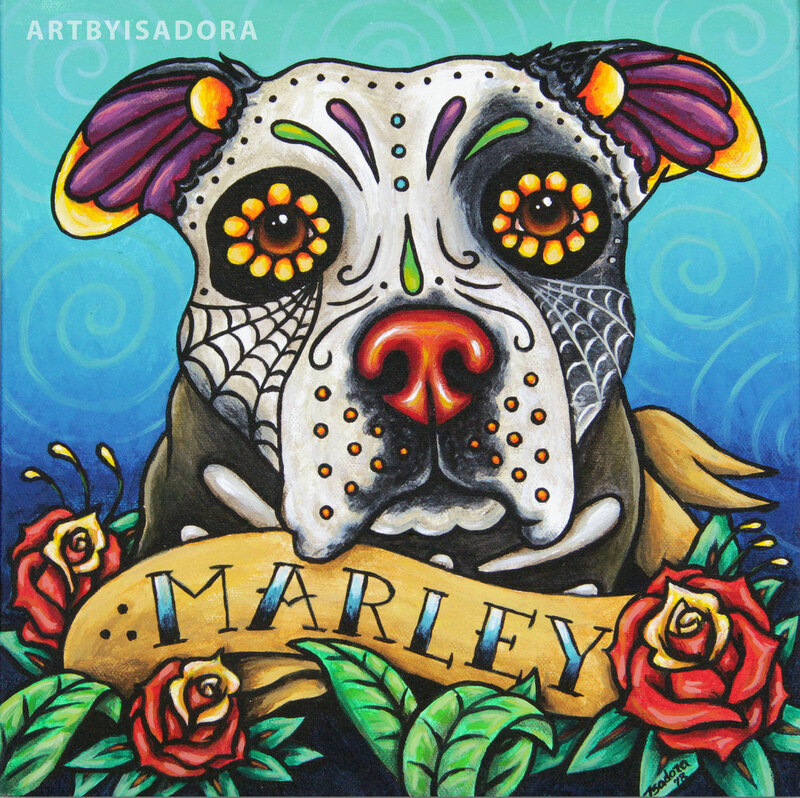 If you like bold, colorful art which really makes a statement in your room, a colorful pet portrait could be just the right accent to bring in some vibrance and show your love for your very own fur-baby! 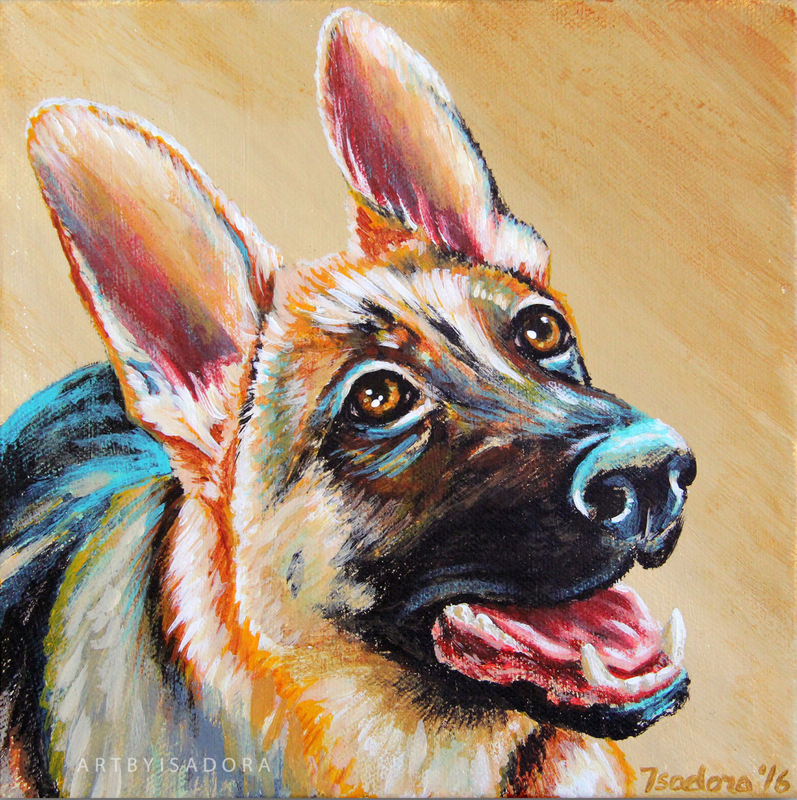 These portraits also make a fantastic gift for the pet-lover in your life. They’re on-of-a-kind and absolutely beautiful. Getting a custom portrait painted of your pet is fun, too. I have a wide variety of sizes available, which ensures that you’ll be able to pick just the right one for both your space and your price range. You pick your size, then send me photos of your pet and some information about his or her personality. Knowing this really helps that personality shine through in the painting. After finding out if you have colors you use often in your home decor, or if there are any particular colors you’d like used in the painting, I’ll provide you with a sketch of your pet’s pose and positioning on the canvas, as well as a few color palette options from which you can choose. After that, I’m off and running on your portrait! You’ll receive a photo of the completed portrait for your review prior to shipping, and then the next thing you know it’ll be at your doorstep. If you’d like to have a custom colorful portrait painted of your pet, click here to go to my ordering page. I’m looking forward to working with you! 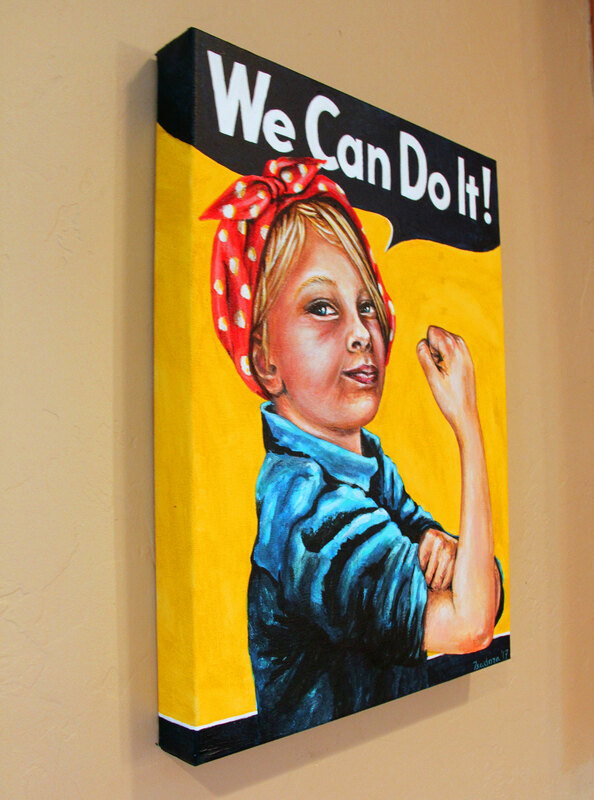 Show the strong little girl in your life that "she can do it" with her own, custom-painted "We Can Do It!" painting featuring her caricature in the painting! This is the perfect feminist gift for the holidays. Rebel girls rejoice in gifts celebrating the strength and power of our future generation of women! 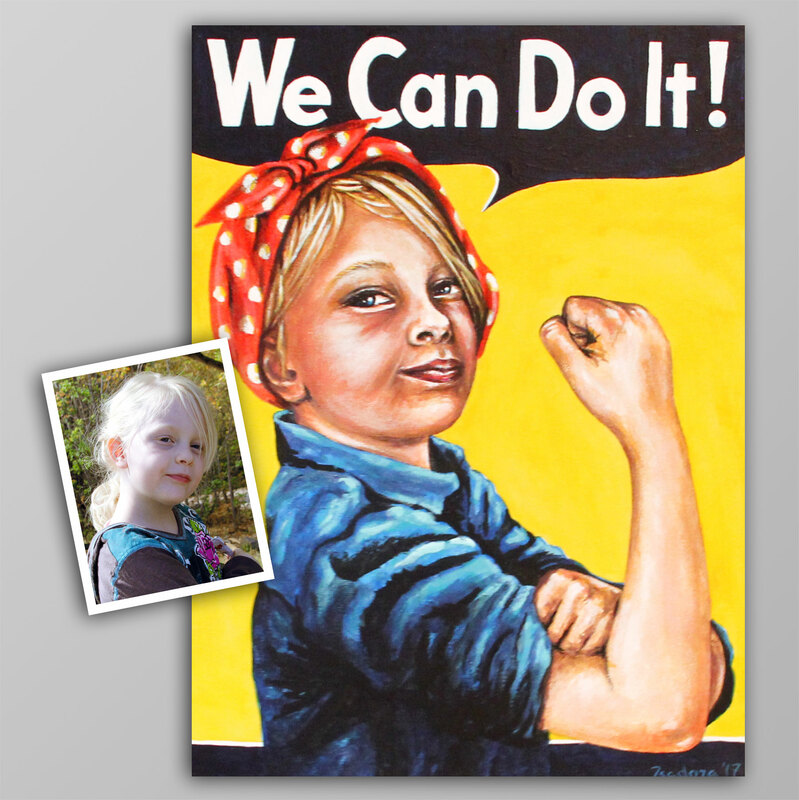 Click here to order this custom painting for your empowered little girl! Prices start at just $100 for an 8" x 10" canvas size. 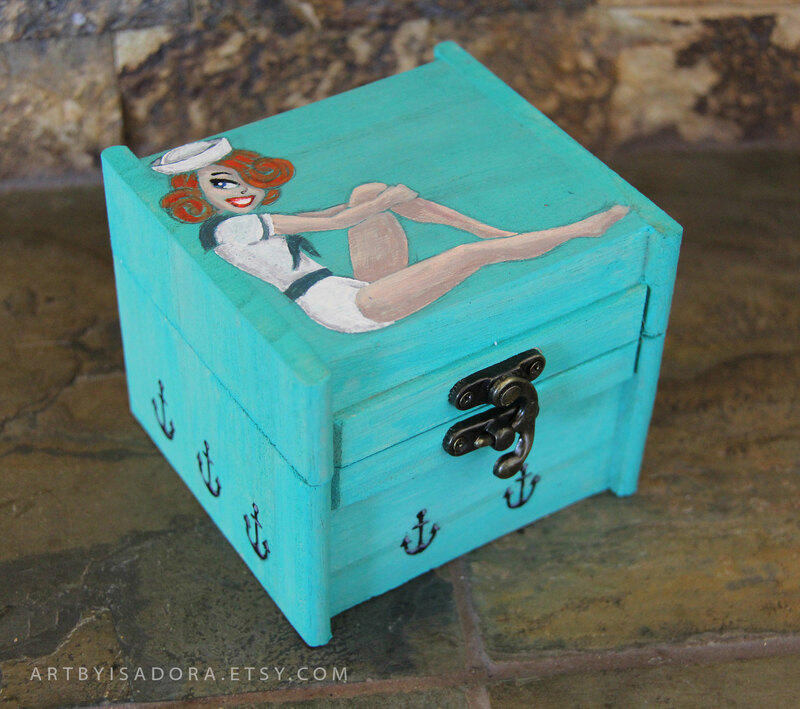 I originally painted the sample shown in the photos for my own little girl's room. She loved it and said, "Mommy, I look so powerful!" when I hung it above her bed. I immediately decided to offer it in my shop so that, I hope, many other little girls will feel similarly empowered to see their own caricature painted in this iconic image. The painting itself is created on a high quality, archival canvas, gallery-wrapped on an extra-deep 1.5 inch deep stretcher bar. 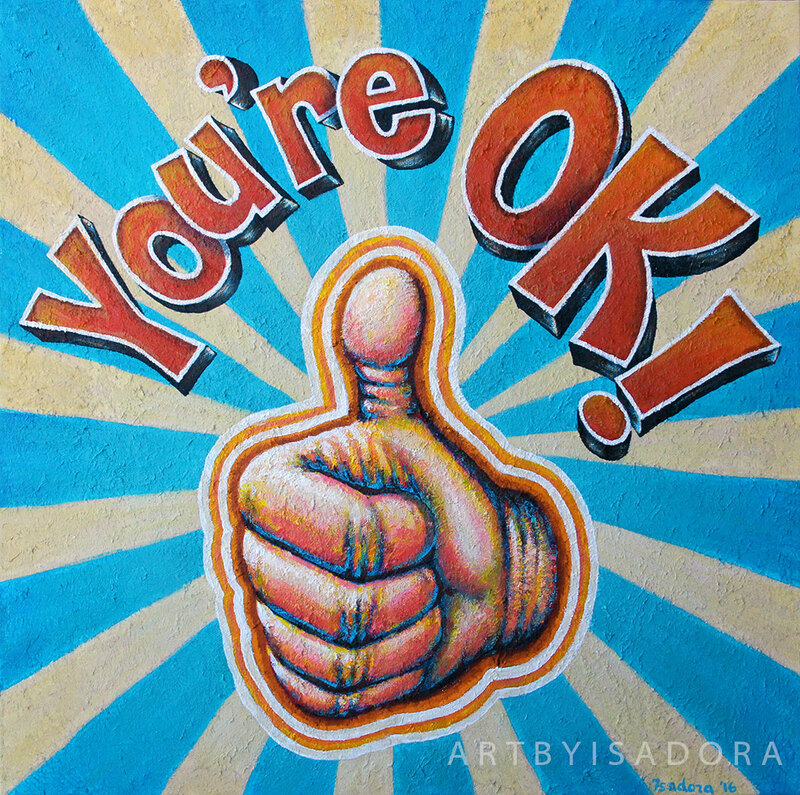 I use only professional quality acrylic paints and canvasses, just like I do for the paintings I send off to art galleries and art shows. Even if it's intended for kids, I make sure that this is still an heirloom quality piece. I also install a professional, strong, coated hanging wire for you, so it's ready to hang the moment you pull it out of the box. What style of pet portrait is right for you? 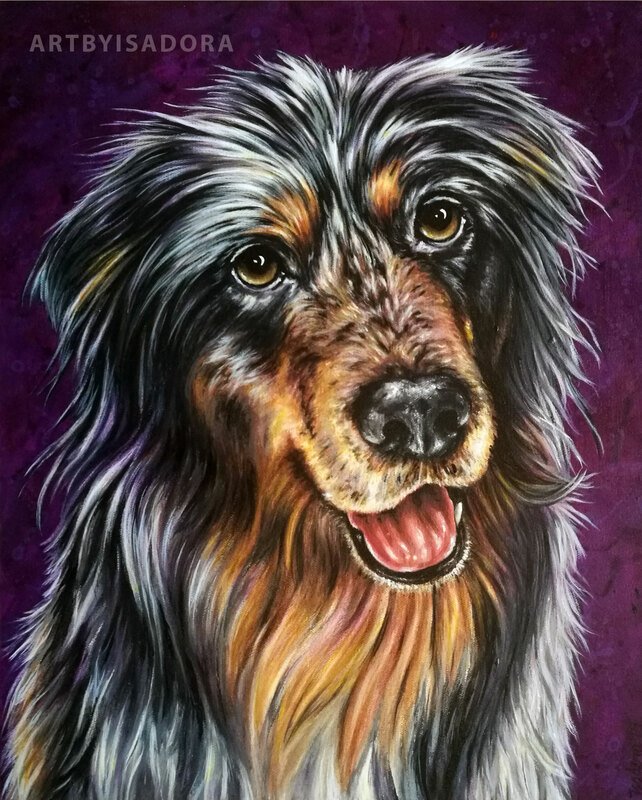 I offer a variety of styles of pet portrait paintings. Check out your options below to decide which style best suits you and your pet. Remember, every pet portrait commission is completely custom, so you can make requests as well! This colorful pet portrait is painted on canvas, with as much or as little bold use of color as you'd like. These portraits tend to have a lot of energy and really brighten up a room. 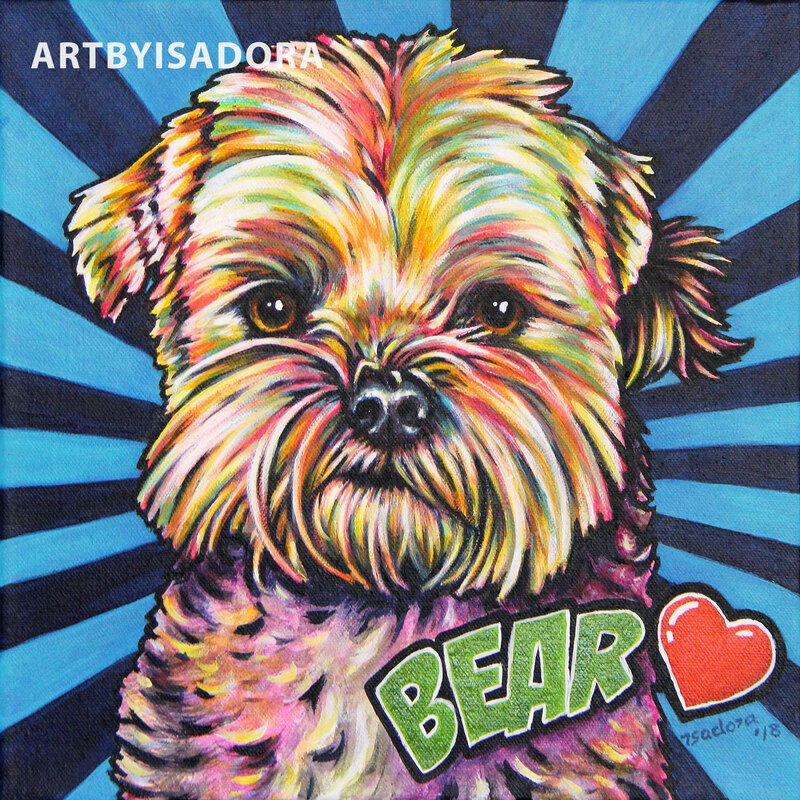 Click here to order your colorful pet portrait. My traditional pet portraits are painted with more of a "realism" style and are an elegant accent to any room. You can always request a few extra pops of color to be added to these portraits if you choose. 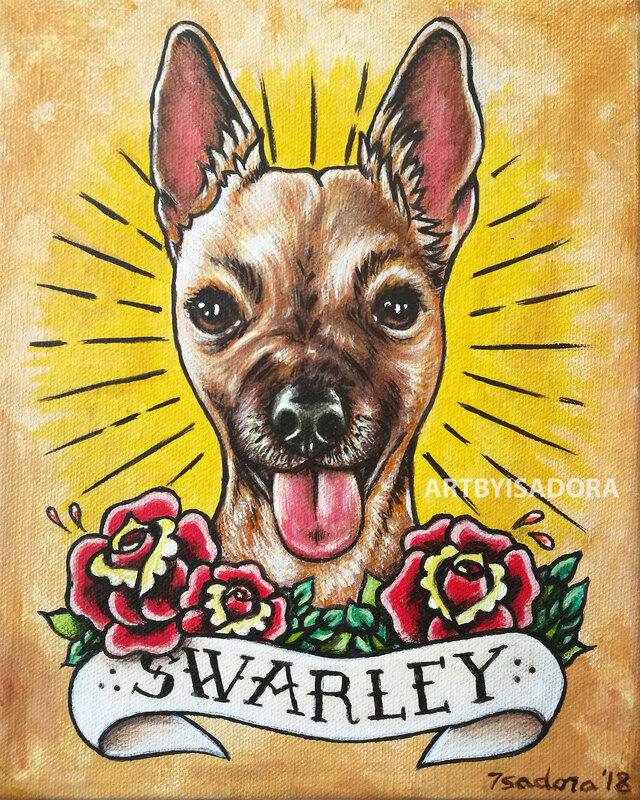 Click here to order your traditional pet portrait. 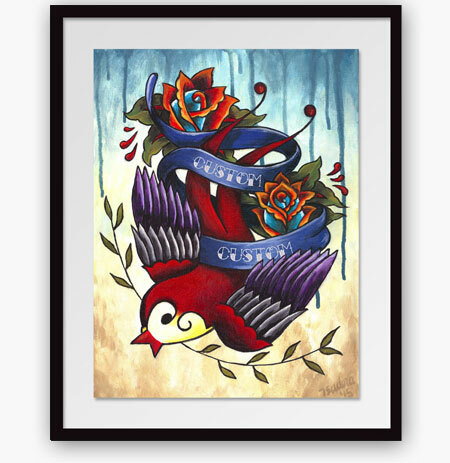 I create these paintings with a fusion of my painting style with the amazingly beautiful Mexican Day of the Dead style for a truly unique piece of art featuring your beloved animal. It is a dreamy and surreal take on portraiture. 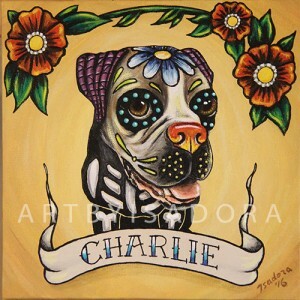 Click here to order your Day of the Dead pet portrait. 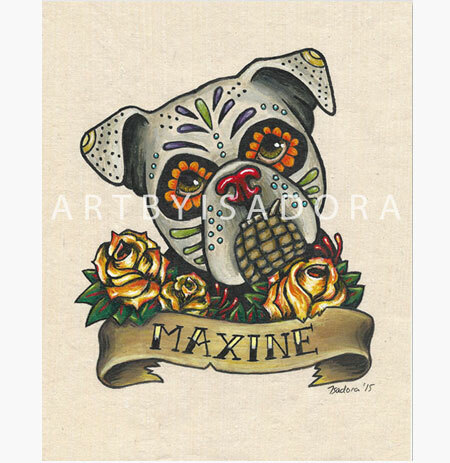 These sugar skull portraits are painted in more of a "tattoo" style, on beautiful, hand-made rice paper with a gorgeous emulsion of sea shell powder that gives it a lustrous surface. They include your pet's name in a banner as shown. Similar to the previous portrait, these are painted in a Day of the Dead style with your pet's name in a banner. The difference is that these are painted on canvas, so there are more size options, and the entire background is hand-painted with flower accents. 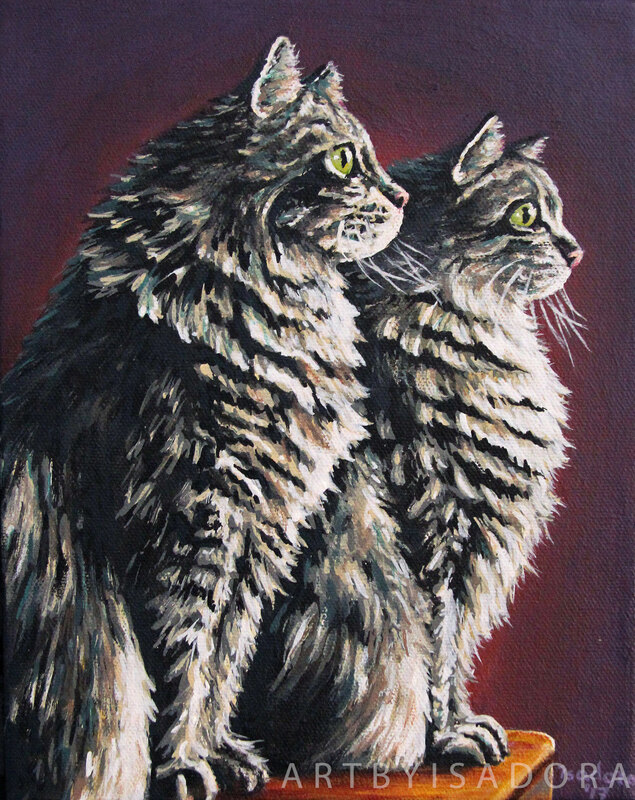 This is a popular pet memorial painting. Ideas for Mother's Day can be hard to come by sometimes. What do you get for the woman who raised you and continues to love you more than any other human being on the planet, despite everything we put our moms through over the years… I mean, let's be honest here. From writing on the walls to stomach bugs to broken vases, our moms have cleaned up after us and loved us through thick and thin! They deserve something really special on their special day. Never fear, I have you covered! Moms love something that is unique, made just for her. 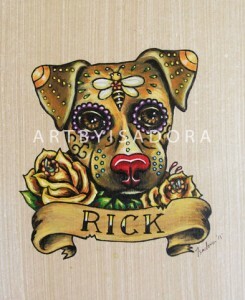 Order your mom a custom portrait of her favorite pet, or of her grandchildren. Next to you, there's nobody she loves more! If time is getting tight, you can still do it! I offer gift certificates for my custom portraits as well, which allow your mom to be a part of the process as I create the portrait for her, with her input along the way. It's a fun process and again, something so unique she'll treasure it for years to come. 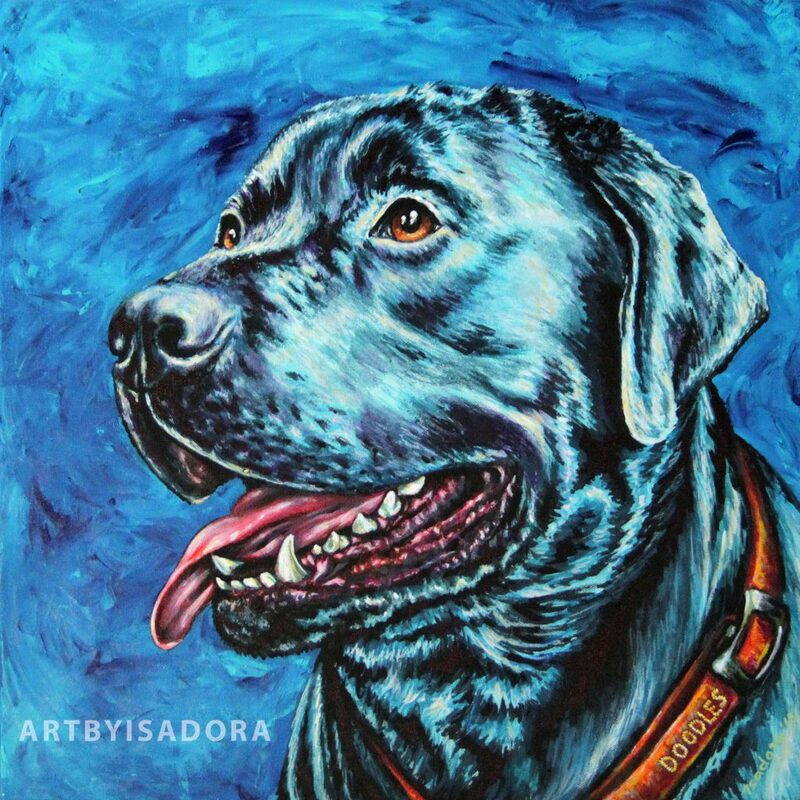 Click here to order a custom pet portrait! 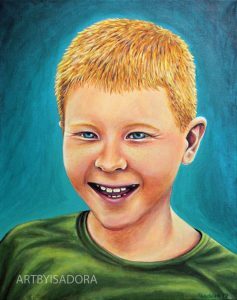 Click here to order a portrait of a child! 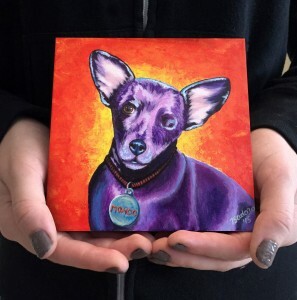 These small, custom pet portraits are absolutely adorable and are perfect as gifts or as “pocket portraits” to fit easily in your cubicle at work, on your bedside table, or even into your suitcase when you travel! Slide one into somebody special’s stocking during the holidays or tuck one into a little gift bag for a BIG surprise! These little beauties have the same high quality work put into them as my very popular larger portraits on canvas… they’re just smaller! Order your “pocket portrait” here! These portraits are painted on DaVinci Pro Panels – strong wood panels crafted from fine-grained Birch wood for long-term warp resistance and a fantastic archival painting surface. They are gesso-primed, painted with professional acrylic paints, then finished with a beautiful gloss varnish for protection, beauty and longevity. You have your choice of a 4″ x 6″ or 5″ x 5″ panel. It's time to start thinking about Christmas gifts, especially if you want to give a unique, custom gift such as a hand-painted pet portrait. I already have half-a-dozen orders in for Christmas. I love those early orders, because they give plenty of time for me to spend making their portrait just right! I have many options available for the pet-lovers on your Christmas list. 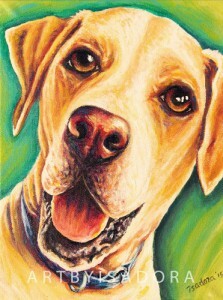 Check out my Pet Portraits page for a variety of styles of custom-painted portraits for everybody on your list. I offer everything from traditional pet portraits, to bold and colorful pet portraits, to tattoo-style paintings of you pet… even Day of the Dead style pet paintings! 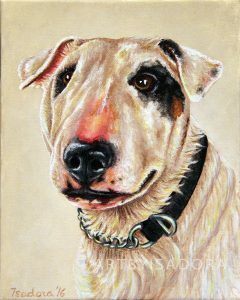 A custom pet portrait is a one-of-a-kind gift that is surprisingly affordable and sure to be treasured for years to come. My portrait options start at less than $100! If you're looking for something a little different for the dog or cat lover on your Christmas list, try browsing around my Etsy shop. 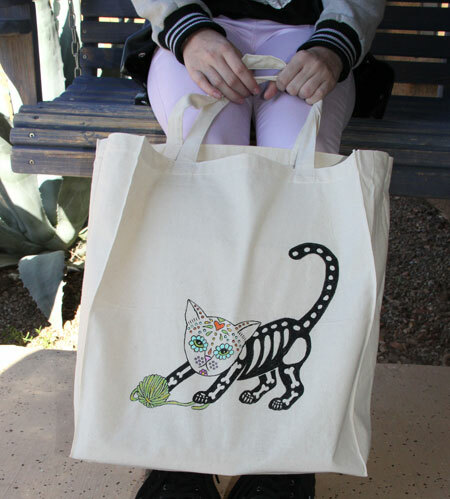 I have many ready-made gifts such as hand-painted tote bags with a variety of art on them, already painted dog and cat art, prints and more. Explore, and find a hand-made gift for everybody on your list! Click on any of the images below to order a similar style of pet portrait! You'll see all of the size and pricing options right on the page in my shop.